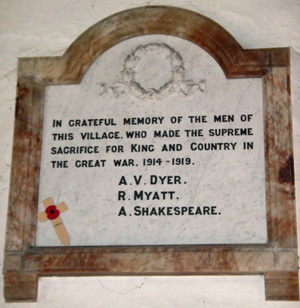 Alabaster tablet in St Mary's church, Great Washbourne, Gloucestershire, UK. IN THE GREAT WAR. 1914 - 1919. Below this is a plain black framed memorial to the only villager killed in WWII. 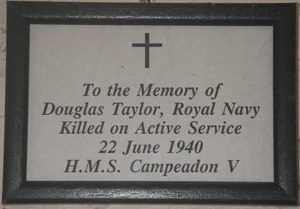 Located in St Mary's church. Asst Engineer A. Roberts A.N.R. 185284 Gunner W.J. Green R.F.A. 212396 Pte F.A. 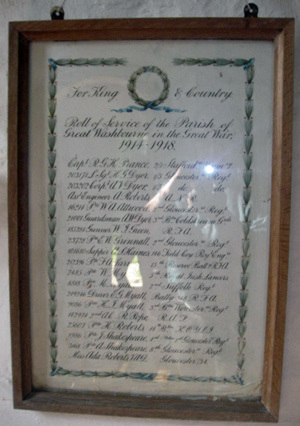 Larner 15th Reserve Batt R.F.A. 142974 2nd A.C. R.Pope R.A.F. 101610 Sapper A.S?. Haines 2nd initial may be wrong.